Before we will start discussing all areas of the Ba Gua map, we must make something clear. It is very important. It will be quite normal if you'll decide to organize all Ba Gua sectors in your apartment at once. But this is not exa ctly right. There is no need to hurry, first you have to evaluate everything properly. If you grab it all at once, you will most likely not be able to achieve a really good result. The fact is that the beneficial "Qi" energy will simply dissipate in the house, because it will be forced to work at the huge number of areas at once. 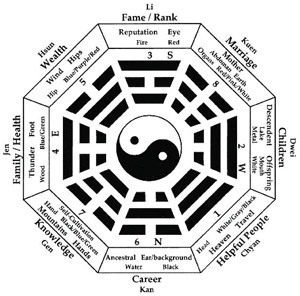 Of course, all zones of your house are equally important to you, but you must choose just one or two that are really relevant for today - as a start. Over time, you can choose from the other sectors and strengthen them also. Problems should be solved as they come and according to the degree of their importance. Therefore, consider well your life situation, we believe, that you will easily understand without a psychoanalyst, what you must change first. Maybe this is love, and maybe - money. Do not hurry, you need to evaluate everything very well, although it is sometimes happens, that the problem lies in a completely different field. Pick up exactly the area in which the solution of problems will lead you to the success in general. Practice has shown that it takes from three weeks up to one month for the activated zone to start working. At least, it is too early to make any conclusions before the specified time. And do not think that once you have installed the last attribute in the area of wealth, the money immediately will be sprinkled from the sky. Be patient and believe in your good luck, then it would find you sooner or later! And, please read again our advice for the beginners. If you decided to establish a situation in three interrelated areas - such as wealth, fame and career - you can act bravely: in this case the energy of one area is affecting the second and the third, without forming a contradiction.